With total spending at approximately $3.7 trillion a year, or 18 percent of the U.S. economy, America’s healthcare system is the most expensive in the world. Spending has increased faster than inflation, the economy, or wages—yet when it comes to quality and health outcomes, performance is often no better than in most other developed nations, and in some instances, it is much worse. Experts agree that a significant amount of the care being provided is unnecessary or is being delivered inefficiently. Increasing the quality and decreasing the cost of U.S. healthcare is important for many reasons, including improving Americans’ quality of life and strengthening the economy. There are “bright spots” in the healthcare system—healthcare providers in communities large and small are consistently delivering high-quality care at a lower-than-average total cost. Perhaps most importantly, some of these providers operate on America’s “Main Street,” where the advantages of large scale or unique medical cultures formed over decades are nowhere to be found. The fragmented nature of the U.S. health system and its poor incentive structure have impeded the broad adoption of innovative solutions to improve quality and lower costs. The Peterson Center on Healthcare is developing a comprehensive approach to finding existing innovative solutions that improve quality and lower costs, and accelerating their adoption on a national scale. High-value care is what results when care that is high-quality and lower-than-average total cost intersect. Stanford’s CERC team systematically identified primary care practices that routinely achieve high performance—high-quality care at a lower-than-average cost. The team first looked at single- and multi-specialty U.S. physician practices with at least two physicians providing primary care. They narrowed the list to those whose performance landed them in the top 25 percent on quality measures. Quality measures were predominantly sourced from HEDIS (Health Effectiveness Data and Information Set)—a universally recognized set used by more than 90 percent of U.S. health plans for assessing quality. Researchers then eliminated all sites where total annual per capita health spending by commercial health insurers did not also fall into the lowest 25 percent—after adjustments to reflect the severity of illness of their patients. Fewer than five percent of the roughly 15,000 sites assessed by the CERC team ranked in the top quartile on quality and the bottom quartile on costs. Experts at nationally recognized institutions—including the Harvard T.H. Chan School of Public Health, RAND Corporation, University of Michigan, Yale School of Public Health, and others—helped shape the analytic methods of the CERC team. The second step of the approach was to identify the features or characteristics of these physicians that help explain their exceptional performance. The CERC team conducted a series of in-depth site visits with a sample of high-performance physicians to understand their distinguishing features. For comparison, the team also visited other primary care practices whose quality of care and cost scores were closer to the average. Through this combination of quantitative and qualitative analyses, the CERC team identified 10 features of primary care sites that consistently delivered exceptional value to their patients. There is considerable diversity among these high-performing practices. These distinctive features were not linked to the sites’ ownership, location, or characteristics of their patient population. About a third are independent, primary-care-only practices. Others are independent, multi-specialty practices, while still others are affiliated with a health system. One practice is a workplace clinic, while another is a federally qualified health center, or FQHC. Their patients vary widely in their age, income, insurance status, and race/ethnicity. Some are urban, while others are suburban or rural. Geographically, they are spread across the nation—from Rochester, N.Y. to Yorba Linda, Calif., and from Springboro, Ohio to Kissimmee, Fla. These findings build on the wisdom of two current physician-led initiatives to improve care: the Patient-Centered Medical Home and Choosing Wisely. However, findings relating to wider interactions with the healthcare system and several findings relating to team-based practice organization extend into new territory. The findings challenge some common beliefs. While there’s widespread recognition that pockets of excellent value exist in the U.S., some believe they hinge on replicating methods used by very large health systems with an efficiency culture cultivated over many years. The exemplary practices that we found, however, showed that primary care practices without these advantages can also deliver exceptional value. Equally surprising, these small-scale, mainstream primary care exemplars enjoy a competitive income and good quality of work life. Lastly, they demonstrate that superior quality can coexist with low total population-wide health spending. 1. This $300 billion estimate would represent savings of approximately 10% of U.S. healthcare spending. 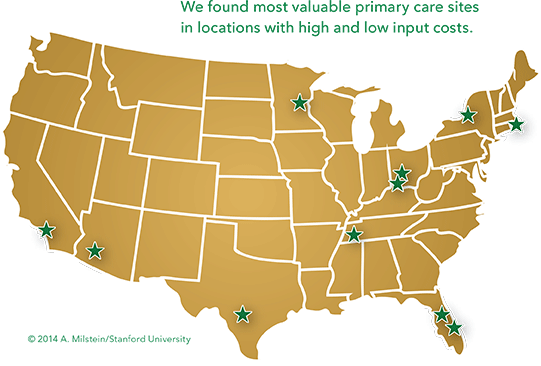 The Stanford CERC analysis indicates that the primary care site with the lowest per capita spending among all sites ranking in highest quality achieved 58% lower total per capita health spending compared to national averages. (Please note that prior versions of the Stanford analysis incorrectly indicated that the 58% lower per capita spending was the average savings of the high-performance sites, rather than the savings of the lowest site.) Further analysis by Stanford CERC is underway regarding projections of the potential to reduce the total cost of care through the adoption of these features.